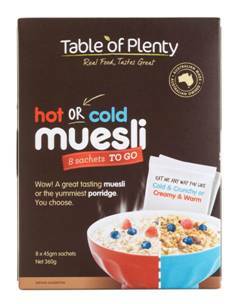 Disclaimer: I was sent the Table of Plenty Hot or Cold Muesli to review. I live in a household where our shopping list doesn’t pander to individual tastes. We buy one type of toothpaste, one type of milk and, naturally, one type of cereal. Once upon a time, I actually used to make my own cereal (much less hassle than you think – although ironically I find these days the problem is sourcing the ingredients, rather than finding the time), but at the moment our cereal choice is dictated by a toddler who eats, in terms of body weight, a good 4-5 times more than I do. So in many ways I am perhaps not the best person to review a muesli, but then, with no preconceptions or current favourites, perhaps I can be a unbiased. Table of Plenty is an Australian owned and made product (and we all know how important it is to buy Australian!) and the story behind the brand is both passionate and a little bit heartbreaking. Table of Plenty makes products other than breakfast cereal, and I’ve certainly seen the dukkah on sale at local supermarkets. The new Hot and Cold Muesli is available at Woolworths and has the added bonus (if your diet is that way inclined) both being dairy free and wheat free. A box contains 8 45g packets of the muesli. My first thought that this was somewhat wasteful in the packaging department, closely followed by “just 45g? who are these people who eat so little?!”. However, I did actually experiment with this and it turns out that left to my own devices I’d eat far too much, as that 45g packet was easily enough to get me through to lunch time. Lesson learned. For my first try, I went the hot option. The muesli, plus half a cup of milk, plus a burst in the microwave. Hmmm. As someone who won’t buy multiple products, I see the appeal in a dual purpose cereal and, as someone who loves porridge, I certainly understand the appeal of a hot breakfast. But hot this just didn’t work for me at all: I found it a bit heavy and a bit cloying, not so much through sweetness but through the cinnamon. I was pretty relieved that served “cold and crunchy” I genuinely enjoyed it. 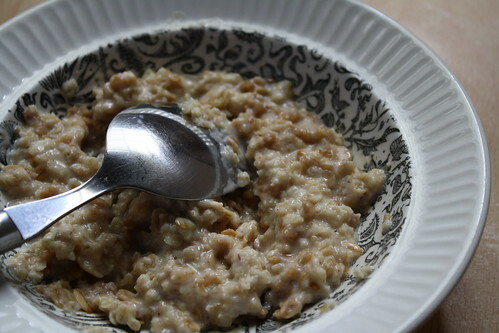 The cinnamon which had seemed overpowering when hot was much less pronounced and the muesli was not particularly sweet at all, with just bursts of sweetness from the sultanas, with some extra crunch from pepitas. As sweetness is my main complaint about commercial cereals, this is an absolute plus point for me. I also liked that it wasn’t loaded up with tons of different dried fruits and bits and bobs: the cereal is relatively simple and straightforward, which leaves you plenty of scope for adding to it yourself. If you’re a muesli eater – give it a go. And if not – keep an eye out for Table of Plenty’s other products and support an Australian business. cannot buy hot/cold muesli in Elizabeth areA (s.a)wHAT SUPERMERKET SUPPLIES IT?? According to the Table of Plenty website it should be available in both Coles & Woolworths and may be available in some independent supermarkets. It is listed on the Woolworths online shopping so it might be worth asking in store. Hope this helps!